Atractor is a non-profit private association created in April 1999 in Portugal for the popularization of Mathematics. Its purpose is to attract people to Mathematics at different levels, trying to reach the broadest possible cross-section of the public. This film illustrates how the great majority of seahells existing in nature can be generated by a fixed set of equations by simply varying some parameters. This gives one more example of how the apparent complexity one sees in nature may have a much simpler mathematical inner structure. 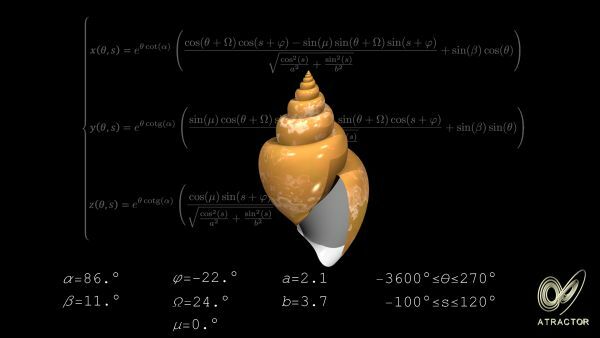 The film “The math of shells” is divided in two parts: first, we can observe the role of the different parameters of the mathematical model; and then, after obtaining a first model of a seashell – a whelk –, the film goes on, illustrating a process to build sequentially seven other models of real seashells, by changing the values of the parameters. At the very end, some other examples of real seashells obtained by other changes of the parameters are briefly displayed.